In a world inundated with products and specialty services, new-age regimens and vitamins that promise to renew one’s skin, it’s difficult to know which of these is worth it. After all, for someone with acne scarring, what are the chances that a “cream” is going to erase evidence from years of skin trauma and facial blemishes? This is where Microneedling comes in. Perhaps you’ve heard of this now-famous technique, made popular by Kim Kardashian. A form of collagen induction therapy, microneedling is a non-surgical, minimally invasive treatment that rejuvenates the skin. As such, it has become the secret to smoothing away acne scarring for many. 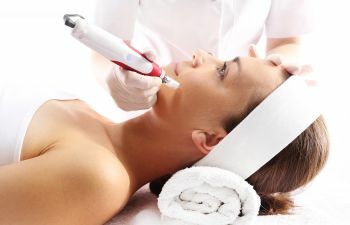 Microneedling essentially wakes up the skin with the use of a bunch of tiny needles that are run over the skin using a hand-held electric device or wand. It’s important to understand that prior to beginning the microneedling treatment, stem cell cytokines are applied as an activator to the surface of skin (this process is repeated following treatment to enhance healing and healthy cell generation). Thus, when the treatment begins, the activator is “needled” into the skin. The treatment itself causes microscopic injuries to the skin, which are necessary to signal collagen and elastin production. What this means is that the skin’s natural healing properties are rushing to these areas to repair and rejuvenate. However, to take treatment up a notch, many physicians are combining microneedling with radio frequency (RF), which is altogether better at penetrating the dermis. For individuals with deep acne scarring, and even those with deep lines and wrinkles, the RF component is a game changer. Depending on an individual’s level of scarring and damage, along with their personal aesthetic goals, microneedling is typically recommended in a series of treatments. For instance, a patient might be instructed to have one treatment every four weeks for a set amount of time. Regardless of the number of treatments one receives, however, the results speak for themselves, as more and more patients report dramatically reduced acne scarring, decreased pore size, even skin tone and improved texture. An extension of Kalos Facial Plastic Surgery in Atlanta, The K Spa delivers advanced and scientific based microneedling procedures, overseen by dual board certified plastic surgeon, Dr. Benjamin Stong. To experience state-of-the-art facial rejuvenation with the highest level of precision and safety, contact The K Spa today.